Gedung Merdeka (Merdeka Building), in 1895, only a simple building. The building, which has a land area of ​​7,500 square meters, became the meeting place of "Societeit Concordia", a club consisting of Europeans, especially the Dutch who live in the city of Bandung and surrounding areas. In 1921, the building, named after its association Concordia, was overhauled into the most lux, complete, exclusive, and modern super club building in the archipelago by the designer of C.P. Wolff Schoemaker with Art Deco style. And in 1940, done improvements on the building to make it more interesting, that is by renovating the left wing of the building by the designer A.F. Aalbers with style of International Style architecture. The function of this building is as a place of recreation. During the Japanese occupation, the main building of the building was renamed Dai Toa Kaikan used as a cultural center. The left wing of the building is named Yamato which serves as a drinking place, which then burns (1944). After the Indonesian Independence Proclamation (August 17, 1945), this building was used as the headquarters of the Indonesian youth to face the Japanese army and then became the place of Bandung City Government activities. When the occupation government (1946 - 1950), the function of the building is returned to the place of recreation. 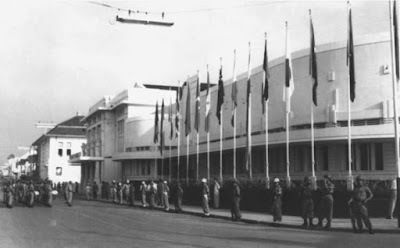 Ahead of the Asian-African Conference, the building was repaired and renamed by the Indonesian President, Soekarno, to Gedung Merdeka on 7 April 1955. 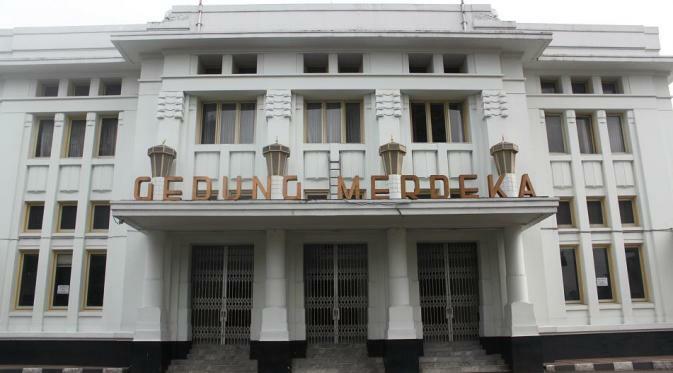 After the formation of the Constituent Assembly of the Republic of Indonesia as a result of the general election of 1955, Gedung Merdeka was made a Constituent Building. When the Constituent Assembly was dissolved through the Presidential Decree of 5 July 1959, this building became the site of the National Designer Agency (Bapenas) in 1959, then changed to Temporary People's Consultative Assembly Building (MPRS) from 1960-1971. In 1965, the building took place at the Asian African Conference of Islam. After the eruption of G30S rebellion in 1965, Gedung Merdeka was controlled by military agencies and part of the building was used as a place of political prisoners. In 1966, the maintenance of the building was handed over from the central government to the West Java Provincial Government, which was subsequently handed over to the local government of Bandung Municipality. In 1968, the MPRS changed its decree with the stipulation that the submitted is the master building of the building, while the other buildings located at the back are still the responsibility of the MPRS. In 1969, the management of the building was taken over by the Government of West Java Level I from the Government of the Second Level Region of Bandung Municipality. In 1980, the entire building was designated as the location of the Museum of the Asian-African Conference. To maintain the spirit of success of the Asian-African Conference in building agreements and cooperation among countries in Asia and Africa which was held 61 years ago, in making Gedung Merdeka as Museum of Asia Africa Building. Gedung Merdeka still keeps a collection of objects and documentation relics of the Asian-African Conference. There is no charge for visitors who are curious to see first hand the collection of equipment, photographs and ornaments relating to the history of the Asian-African Conference. The museum is open to the public every day, except Mondays and National Museum holidays are closed to the public. Entering the door of Museum KAA Bandung we will be treated to a book to fill the column of visitors list. In the Museum room we will see a room with a very clean and neat interior. Light lamp that is set in such a way as to make the collection on display becomes very clearly visible. The entire collection of the Conference's heritage is well preserved with a very well-preserved condition. In a corner we will see a set of sofas complete with tables, this sofa was once made the place of the first President of Indonesia Sokarno to relax while talking with the Heads of State. To prove that this sofa is already there from the era of its First Asian Africa Conference, on the wall pinned a photo showing the existence of the sofa that is being used Mr. Ir. Sukarno relaxed and talked that time. Complete with tablecloths and ashtrays used 60 years ago. The location of Merdeka Building is in Asia-Afrika Street number 65, Bandung. Location of Gedung Merdeka and Museum of Asian-African Conference located in the middle of the city, making it very easy to reach. 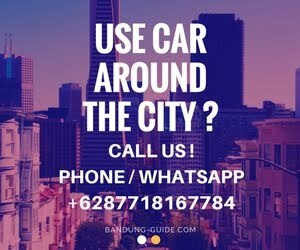 Both locations are located in Asia-Africa Road adjacent to Bandung Square.